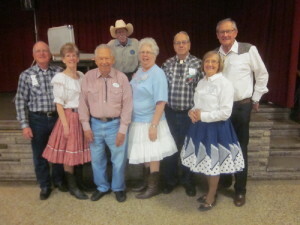 October 10, 2018 – Spares & Pairs Square Dance, Bloomington, Caller Larry Fruetel, Cuer Robin Fryman. Ar-Dale Dancers, County Line Squares, Dakota Grand Squares, Hot Foot Stompers, Square & Twirl, and Triple T danced with Spares & Pairs. Royalty present was Spares & Pairs King Barry, others present were SDM Executive Director LeRoy Elfmann and SDM Vice Chair Barry Downs. County Line Squares with Caller Larry Fruetel.